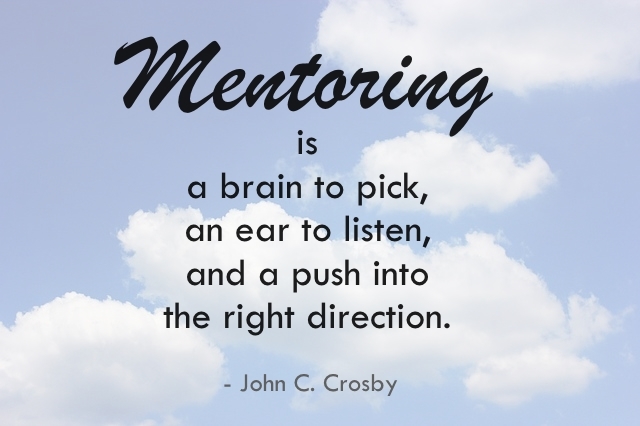 Mentoring can play a vital role for an individual’s career, but also for the success of the whole organization. Implementing a formal or informal mentoring program can help new project managers integrate into the company faster and better and improve their skills. There have been many great mentor-mentee relationships in history, for example Socrates and Plato, Haydn and Beethoven or Ralph Waldo Emerson and Henry David Thoreau. And who can forget the great mentors in pop culture: Dumbledore to Harry Potter, Obi Wan Kenobi to Luke Skywalker and, of course, Mr. Miyagi to Daniel LaRusso in Karate Kid. All these mentors have helped their protégés discover their strengths and encouraged them to be and do their best, and ultimately, succeed. Finding a person that is compatible with you and is willing to impart their wisdom with you is not easy. Mentors can be people inside the company, but they can also be external people. Most people choose someone whom they admire and who is good at what they do, but keep in mind that that does not guarantee that they can explain to you how they got to where they are. Choose mentors who have specific skills, but who are engaged and enjoy their work and take an active interest in, not only their own success, but also in the achievements of others. In project management, effective mentoring can help prevent project failures and improve project management and leadership skills of participants. Of course, the stress here is on ‘effective’, because if done wrong mentoring can cause stress and employees might see it as a waste of time. Here are 7 tips for facilitating a valuable and successful mentoring relationship in project management. Planning is a requirement for any project and it should not be excluded from mentoring. While you don’t have to establish a formal mentoring program planned from A to Z, you still need to determine what you want to achieve in your mentoring relationship. How often will you meet? What will you do during those meetings? These elemental questions should be answered beforehand. When the mentoring has started, you should also document its progress and any achievements of the mentee and the mentor. A typical mentoring relationship is usually between a senior project manager and a new project manager. It’s logical since the more established project manager can impart their knowledge and experiences with their new colleague and help them settle down into their new position. However, it is not only the mentee that can learn, but the mentor can learn from the ones they are teaching, too. So, remember that mentoring is a two-way street where both parties can learn from each other and that it’s a relationship between two equals. A mentor has much more experience than a mentee and thus, can offer advice on many subjects, such as how to turn around failing projects, or how to deal with clients. But it’s important that mentors keep in mind that they can give advice, but they should not expect their mentee to follow it. A mentoring relationship is not about the mentor telling the learner what to do, but to steer them in the right direction and if necessary, let them make their own mistakes. Honesty is of vital importance for a mentoring relationship. Mentors who treat their protégés with kid gloves are not doing them any favors. Sometimes it is necessary to give some tough love. It will help the mentee grow. As for mentees, they should not take it as a personal offense, but try to learn from it. On the other hand, the mentor should give the mentee the feeling that they can also be open and honest without negative consequences. Mentors should not just give out advice and keep talking about their experiences. A big part of mentoring is that the mentor listens to the mentee’s wishes and concerns. Active listening and asking (tough) questions can help both the mentor and the mentee grow personally and professionally. For example, if the mentee has to implement a particularly complex project or is faced with a failing project and doesn’t know what to do, instead of offering the solution on a silver platter, the mentor should ask the right questions to make their mentee think and come up with a solution themselves. Only then will they be able to learn and improve. The schedule and to-do lists of project managers are usually filled to the brink and it can be hard to juggle your workload with mentoring. However, for the mentoring to be effective, the mentor as well as the mentee need to be committed to it. Meet at least monthly. But even in between meetings, the mentor should be available to spontaneous questions or concerns. Maintaining contact and communicating regularly will facilitate the relationship between mentor and mentee developing into more than just an obligation. A mentoring relationship should be confidential. Unless either party specifically agrees to share it with others, everything said between mentor and mentee should stay between the two. This is important to build trust, because you might have to discuss office politics or the mentee might need advice on how to deal with a difficult supervisor. These topics are obviously delicate and only if the mentee feels comfortable enough and trusts the mentor, will they be able to open up. 7 Tips for Mentoring in Project Management - InLoox • Copyright 1999-2019 © InLoox, Inc. All rights reserved.